This tropical fruit is rich in nutrients, which is perhaps why it has been used for thousands of years across the world for medicinal ends. Learn more about its history and uses. Mango, a famous South Asian fruit, has been a popular addition to "tropical" and refreshing fruit platters for decades. It has had great cultural importance around the world for hundreds of years, and researchers believe it was first domesticated as a food crop in the subtropical regions of South Asia, approximately 6,000 years ago. Mangos have become a standard food crop in northeastern India, and many people around the world consume mango on a regular basis for its excellent nutritional value. Speeding up tissue regeneration. Mango's antioxidant content improves the health of soft body tissues and promotes proper skin hydration, also aiding in the recovery of wounds. Promoting eye health. Due to their high levels of carotenoids, mangoes help maintain and improve eye health, preventing vitamin A deficiency and age-related diseases, such as macular degeneration and cataracts. Additionally, some studies suggest that mango may help lower blood sugar levels, thus being effective in the complementary treatment and prevention of hyperglycemia and diabetes. Mangoes are best known for their nutritional value, but their therapeutic prowess lies in the rare phytocompounds present: the main active ingredient in the mango fruit is mangiferin, which is presently undergoing extensive research. It seems to act in combination with over 25 different carotenoids, as well as polyphenols, gallic acid, caffeic acid, catechins, and tannins, in order to promote eye health and wound healing, as well as contributing to stabilize blood sugar levels. Mangoes are an excellent source of vitamin C (ascorbic acid) which is crucial for the well-functioning of the immune system, as well as for proper plant-based iron absorption, strong bones, and heart health. In spite of its seemingly high level of sugar, the mango fruit provides adequate amounts of dietary fiber and carbohydrates, both necessary to help proper digestion and energy production, which increases satiety and reduces food cravings between meals. 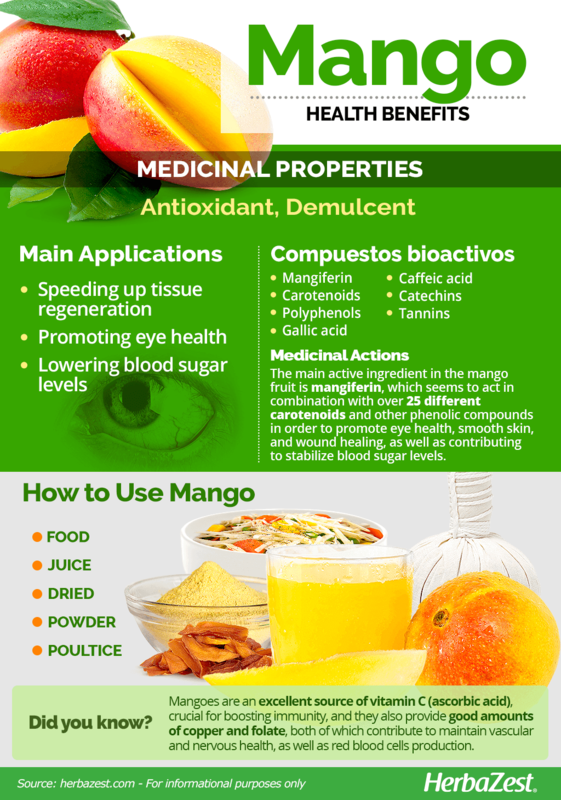 Additionally, the presence of good amounts of copper and folate in mangoes contributes to maintain vascular and nervous health, as well as red blood cells production, whereas vitamins A (as carotenes), B6 (pyroxidine), and E (alpha-tocopherol) support eye health, brain function, adrenal health, immunity, and cells' metabolism. 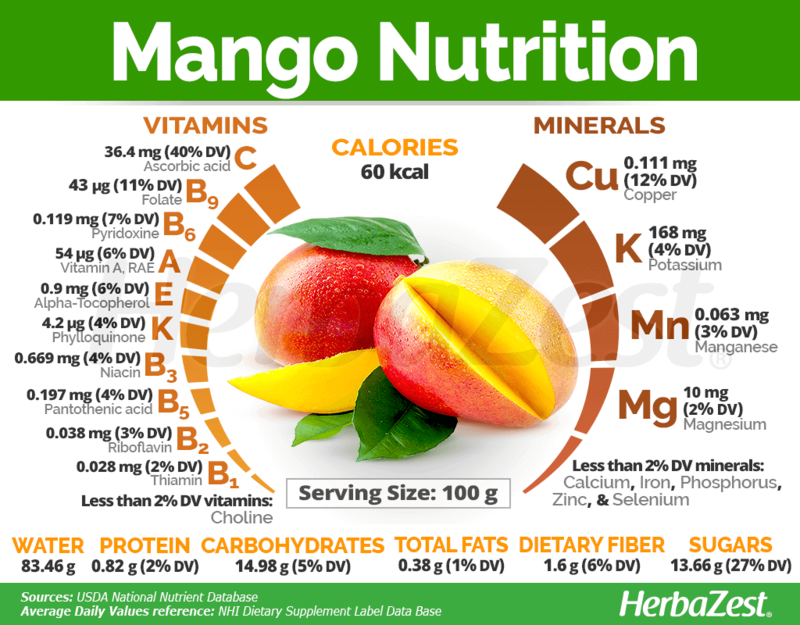 The nutritional value of mangoes is rounded by less significant levels of many other compounds, including minerals such as potassium, manganese, and magnesium, as well as vitamins of the B-group and vitamin K.
100 grams of mango provide 60 calories, as well as 5% and 6% of the daily value for carbohydrates and dietary fiber, respectively. The mango fruit is consumed mainly in its natural, fresh form in a variety of ways. It can be consumed either as a fruit, made into juice, or used as a seasoning for grilled meats, desserts, salads, and many other types of preparations. The flavor of mango has found an easy audience throughout history, satisfying palates in each region to which it has been brought. Mango fruits are highly regarded for their rich, sweet flavor and strong aroma. Typically, any nutritional differences in the various ways of storing mango are negligible, if present at all. Research has shown that there is not a significant difference in the concentrations of vitamin A, vitamin C, and phenolic compounds in pre-cut and stored mangos versus fruits sliced immediately before consumption. 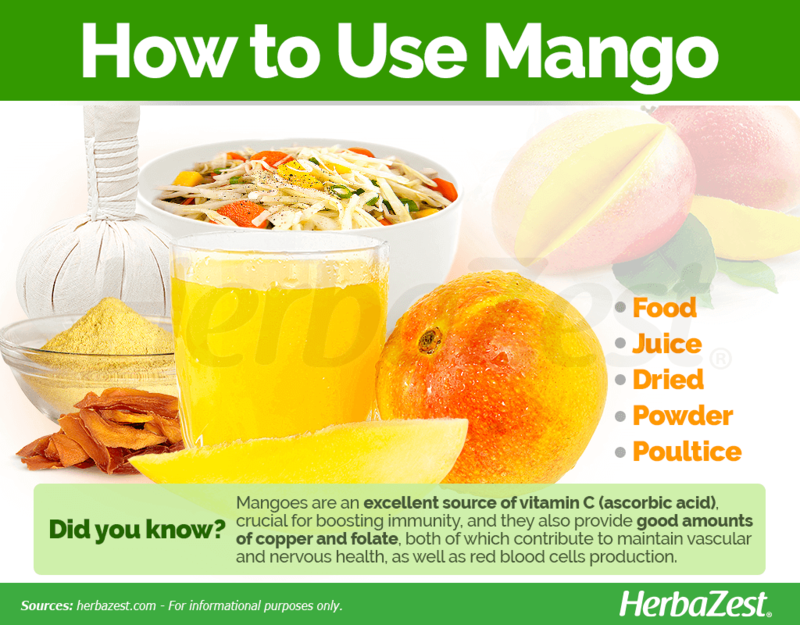 Freeze-dried mangos, however, lose some of their beta-carotene content and antioxidant power. 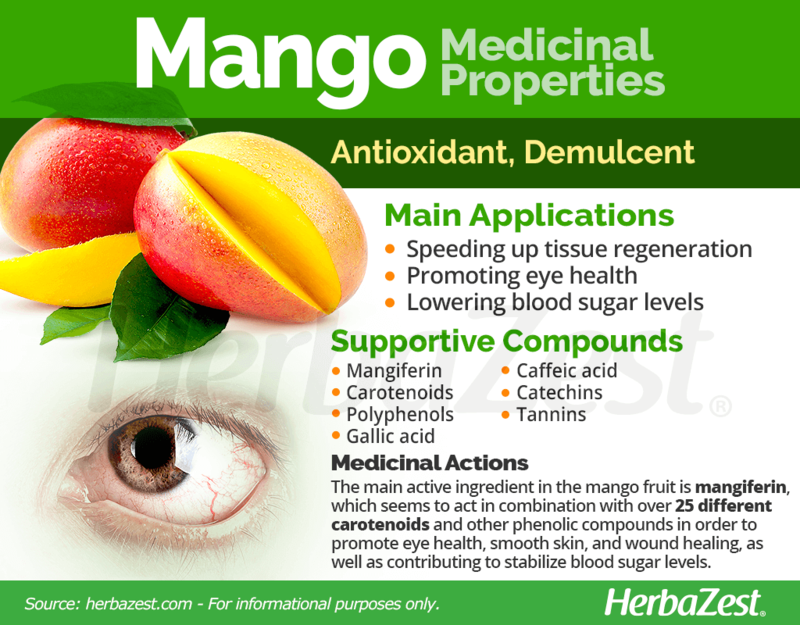 Mangifera indica should not be confused with supplements labeled as "African mango"; they are different plants entirely. Raw mangoes are easy to find in most grocery stores or local markets around the world. They can be purchased unripe to be used in jams and chutneys, or ripe to be consumed raw or cooked to individual preferences in various cuisines. Mango trees can be grown from seed can take up to eight years to bear fruit. Given the proper care and climate conditions, they can be cultivated in a garden. They thrive best when grown in a frost-free, tropical climate, though some cultivars are tolerant of lower temperatures provided they stay above 41°F (5°C). In order for the fruit to develop as big as possible, it is best to plant seeds on slight slopes that favor good drainage and in slightly acidic soils (pH of 6.0 - 7.0). Early September is the ideal time for planting the mango tree. As much flesh as possible should be removed from the seeds, and they should be allowed to dry for two days. Mango seeds should take up to 10 days to sprout initially. The trees should be planted in a position that is exposed to full sunlight. What's the Difference between Vitamin A and Beta-carotene? The mango is the fleshy stone fruit of a medium-sized evergreen tree. The fruit produced can be of different colors and sizes depending on the cultivar. Mango, or Mangifera indica, is a member of the Anacardiaceae family, which contains flowering plants and is often referred to as the cashew family. Mango is a member of the Mangifera genus, comprised of 69 species, most of which are canopy trees. There are now over 1,000 mango cultivars, which have been selectively bred to be more resistant to pests, grow better in certain climates, and produce juicier fruits. Around 20 of these are cultivated commercially in India, a country that boasts over 100 cultivars in all, including 'Alphonso', 'Amrapali', 'Bombay', 'Banganapalli', 'Bombay Green', and 'Bangalora'. On the other side of the globe, the most frequently found mangoes in Western markets belong to the 'Tommy Atkins' cultivar. The oldest remains of fossilized wild mango are over 25 million years old. Mangos were initially propagated by monks in southern Asia around the 4th and 5th centuries BCE. By the 10th century CE, mangoes had been introduced to east Africa and the Middle East. By the 15th century, the mango as a food product had reached the rest of the world. It is estimated that as of 2009, 35 million tons of mango have been produced worldwide annually. India remains mango's biggest producer, contributing over 16 million tons alone. In fact, mango is such a significant part of India's culture and economy that it has been named the national fruit. China, Thailand, Pakistan, and Mexico make up the rest of the top five producers. The top 10 mango-producing countries account for 80% of overall production. The bark of the mango tree can be used to make charcoal, and the tree is often planted to provide shade in sunny areas. 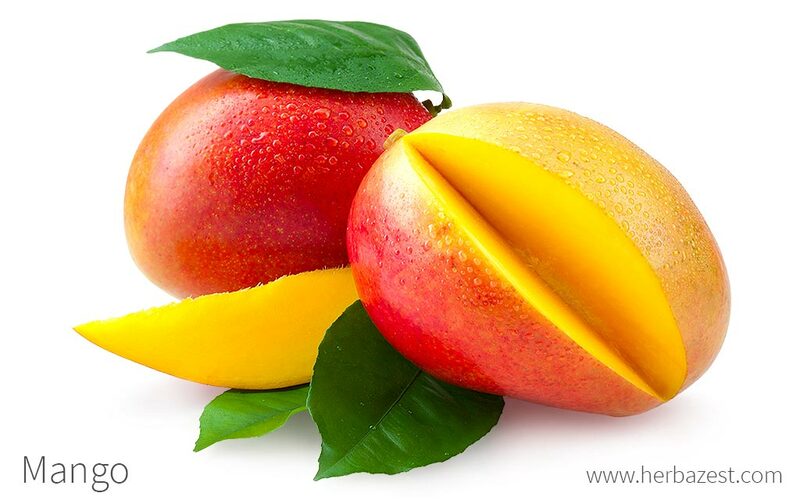 Mango extract is also used in the manufacturing of euxanthin, a yellow pigment widely used in oil paint. Hindi and Tamil religious rituals frequently include mango fruits and branches. The branches are particularly popular for the purpose of decorating archways and houses during weddings and the Ganesh Chaturthi festival.